It has been about five months since I walked across stage in the Times Union Center, five months since I packed up my life and moved to Texas, and five months since I have seen my friends. Although reading that sentence may make it seem like I am setting this blog up to be sob story about being alone in The Lone Star State but (surprisingly) it is not. I am happy and even surprised to say that life hasn’t been too bad since graduation and five months later my life seems to be falling into place. I admit that I spent a little too much time watching Netflix, making some mildly questionable choices, and taking a break from life before I actually started to apply for jobs but I think I earned it after the last four years of my life. Regardless about whether or not my hiatus from life was earned, I can say that I am now gainfully employed at not one but two jobs. At the end of August I landed a job working as a freelance writer for a country website called The Boot. Although I worked at a country radio station in Albany, I was never writing content or fully immersing myself in the “country lifestyle,” so when I started writing about Garth Brooks, “brocountry,” and Luke Bryan while also living in Texas I couldn’t help but to see the humor in it. Writing for The Boot has helped me not only understand the passion people have for country music but also has helped me feel part of my Texas home. 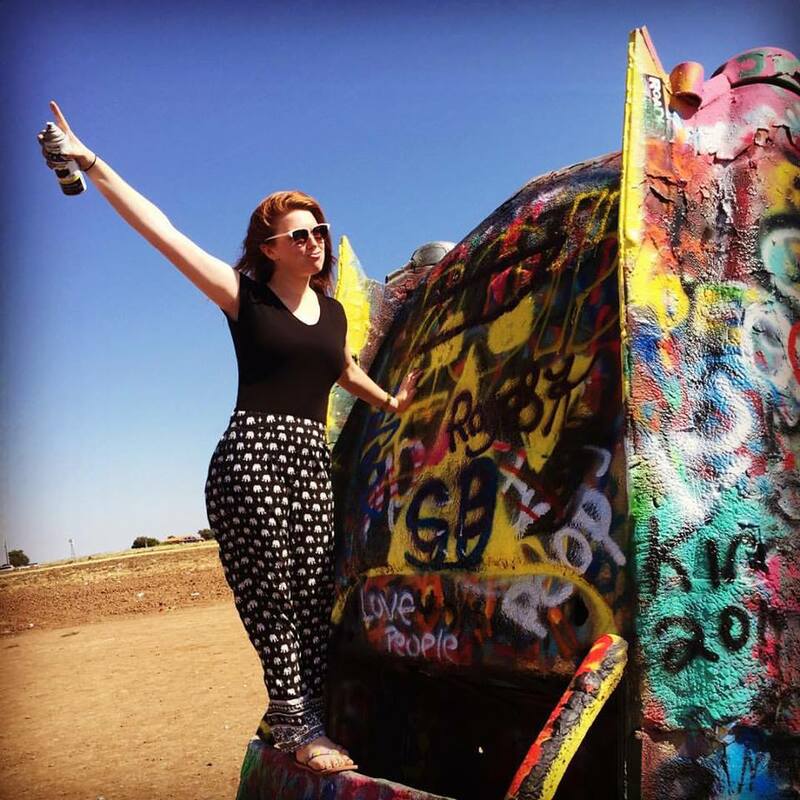 Cadillac Ranch- The cars were awesome, my duck face not so much. After only about two weeks writing for The Boot I scored a dream first job as a Public Relations Coordinator for Moody Gardens. Moody Gardens is one of the top tourist destinations in all of Texas and boosts some pretty cool stuff that I get to check out while working. We have three giant pyramids that each have something different, a replica rain forest that you can walk through with free roaming monkeys, an aquarium that has seals, penguins, and all sorts of fun aquatic things, and a discovery pyramid that features traveling exhibits as well as Spongebob Subpants Adventure. Although it is really cool to work in the same building that houses a Giant Amazon River Otter, the coolest part about my job (so far) has been the fact that I get to travel all around Texas and some other southern states to talk about Moody Gardens on radio programs and TV shows. Since I used to work for a cluster of radio stations I feel more at ease behind the mic, but as I start doing live TV interviews I am becoming more comfortable on camera as well. This past week our media tour brought us to West Texas and I got to check out Cadillac Ranch (Cadillacs that are buried nose down in a field that people come to spray paint), Palo Duro Canyon State Park, and a 2D buffalo that you can ride for photos. I’ll be in Louisiana by the time you’re reading this and throughout the month I’ll be in Austin, Dallas, San Antonio, and some small towns spreading the word about Moody Gardens and our upcoming holiday attractions. Aside from my traveling adventures, the best thing about going to work everyday is the people who I work with. I’ve only been at Moody Gardens for two weeks but I can honestly say that I have some pretty awesome coworkers that have already showed the promise of being some pretty awesome friends. To current seniors– there is so much advice/reassurance that I could give about entering the real world but when I was a senior, those five months ago, I refused to listen. I thought that the world was going to end, that life was going to be pretty miserable, and that I would miss my friends so much. It is true that I miss my friends on a daily basis but it is also true that the world did not end and just like in college there are good days and there are bad days. Thankfully, in the past month I have found a career, coworkers, and adventures that make the good days out weigh the bad. 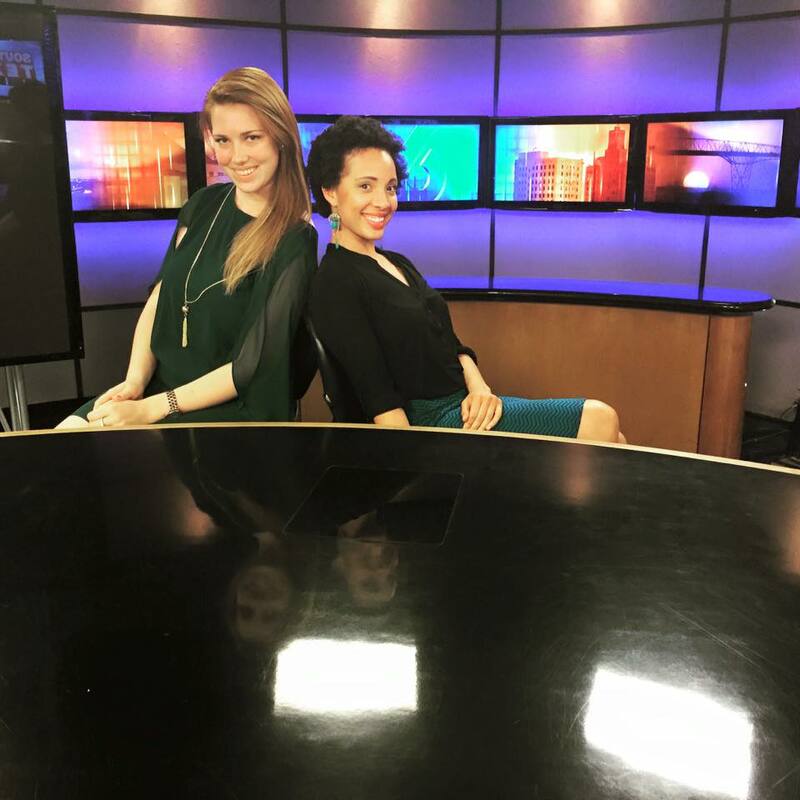 One of my coworkers and I on set during one of our media tours. This will be my last blog post for a while until I come back to visit Saint Rose so until I check in next time, take your cues from Ferris Bueller, continue to hold the door for your peers (although they refuse to use both doors in Albertus), and if you’re a senior know that life will change but once you accept it (and step away from the Netflix) there is a chance it wont be that bad. P.S. No but really, the Giant River Otter that lives in the same building that I work in is so amazing! One of the biologists let me have an inside look into her training and it was amazing to see her do all these tricks- I can promise you that I looked happier to be there than the otter did to be receiving treats. Don’t make me pull out old college cribs videos to prove that you’ve always been very comfortable in front of a camera…haha. But seriously, congrats, Courtney! We are so proud of you! Those College Cribs videos are both a blessing and a curse. And thank you!! Who knows, maybe when I come visit in April and we can make a classic Courtney and Kayla production…. Just kidding, congrats, Court! We miss you! I used to say that to Katie all the time so it is fighting you send it my way. And thank you!! Who wouldve thought I would actually move on? Miss you too!